This blog is solely about the start-to-finish construction of a house. It is recommended to start at the earliest post and proceed chronologically. For the last (almost) 2 weeks, the electricians have been running wire all over the house. Tomorrow we have our rough-in inspection scheduled. Misc tales of an electrical nature below. Apparently, with the budget-price contract I negotiated, if we want anything other than electrical boxes simply nailed to studs wherever they may fall, it costs extra. "Features" like lights centered above a sink, or outlets spaced specifically, are extra. Good contract negotiation, Mr. General Contractor. Ahem. To be fair, many if not most houses suffice just fine with that approach, and such alignments do take time and effort, for which someone shouldn't have to do for free if they hadn't figured it into the bid. As a result, I've had quite a bit of work installing electrical boxes. In a separate trade-off agreement, I ended up installing all of the recessed light housings myself in exchange for an extra circuit to the bathroom. Maybe not the most equal exchange, but at least I know that the lights are installed, with care, where we want them. It was luckily only a fall of about 4 feet, and happened to be cushioned by 3 of our (now defunct) light fixtures stacked below. As I went to install the light over the sink in the upper guest bath, I found that the plumbing vent was conveniently run straight up the centerline of the wall. A judgement call: do I try to get the plumber out to re-route the vent, and possibly get in a dispute about whether or not he was responsible for looking at the plans for coordination? Or do I move it myself and avoid conflict? Guess who has pipe glue on his hands. We wanted to locate a doorbell button at the front door. There was just the slightest gap between the conjoined door and sidelight jambs, and I was determined to route the wire down through that gap. It took some doing, but I got the tiny little doorbell wire down there. Only as I was terminating the wire across the house where the chime is to be located, did I notice that the bell wire I had purchased was only a single strand of wire; not a double. Two wires are needed to complete a circuit. So...Purchase more wire. Fish a second wire. 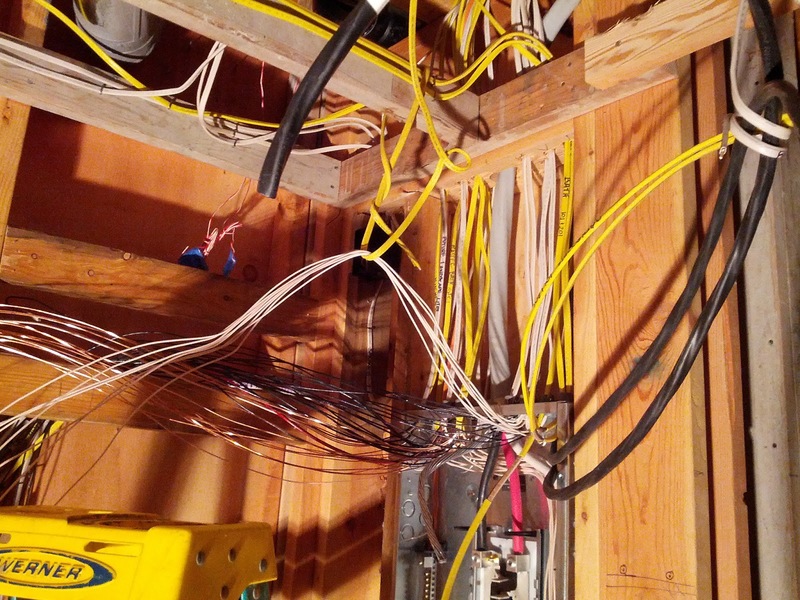 If the first one was difficult, the second in a space already filled by the first wire was excruciating. (No, I could not use the first to pull the second through - I tried to make that work for a good long while). Finally! The metal roof takes shape. © 2014. Lyons Hunter Williams : architecture. All rights reserved. Powered by Blogger.